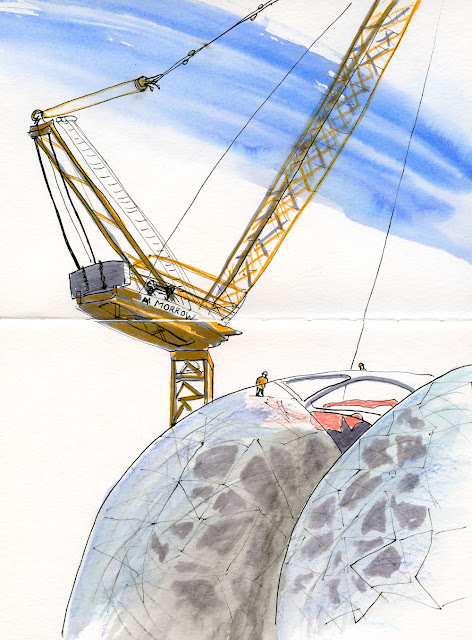 The last time I sketched the Amazon spheres, I stood on the Seventh Avenue side of Lenora Street. The balls’ amoeba-like skeletal structure was still entirely exposed. This morning, two-and-a-half months later, I chose the Sixth Avenue side where I could stand a bit closer. Though still visible, the skeleton is now almost completely covered with a glass skin, and a few workers were way up at the top installing the last of it. Above them was one of the ubiquitous cranes towering over the north downtown/South Lake Union area.